If you are looking for a great family fun boat look no further. We have the boat you will enjoy for years to come. 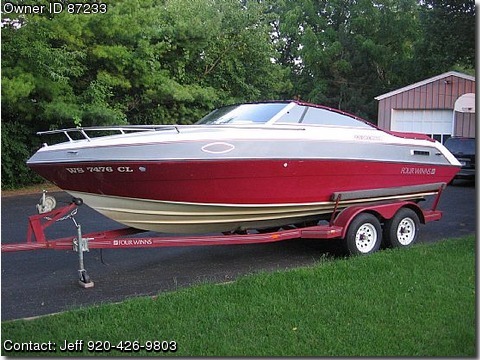 This is a 1989 Four Winns Sundowner with Cuddy Cabin This boat is in Excellent condition and well maintained. A travel cover that starts at top of windshield to aft, which is use to cover the boat in storage and on the way to and from the dock. A half cover (Leather) for over the cockpit as well as an additional zip in cover (Leather with a window) to enclose the entire cabin area. Dual Batt system with 2 new batts. VHF Marine radio with antenna, New Am/FM CD player with Remote control, 4 speaker sytem 2 in rear of boat and 2 in Cuddy, swim platform with ladder, depth finder and sounder, trim indicator, flares and flares gun, Paddel, Anchor Light (for the back of the boat), 2 anchors, porta potti, 3 fenders for docking, 6 orange life jactets in storage bag. as well as trailer.